TVS Motor Company, India’s leading two and three-wheeler manufacturer announced the launch of an all new TVS Jupiter Classic edition. The Classic edition comes with enhanced features, which are set to evoke a sense of timeless reassurance in customers. Popular for delivering high-performance ride quality with superior ride comfort, TVS Jupiter has also stood for promising stylish road presence. The Classic edition offers a variety of novel features such as a sunlit ivory body colour, ‘classic-edition’ decals, elegant full chrome mirrors, a classy chrome backrest, along with other thoughtfully designed features like a smart USB charger and comfortable dual-tone seat. Every feature of the TVS Jupiter Classic edition is a testimony to its elegance and timeless styling. 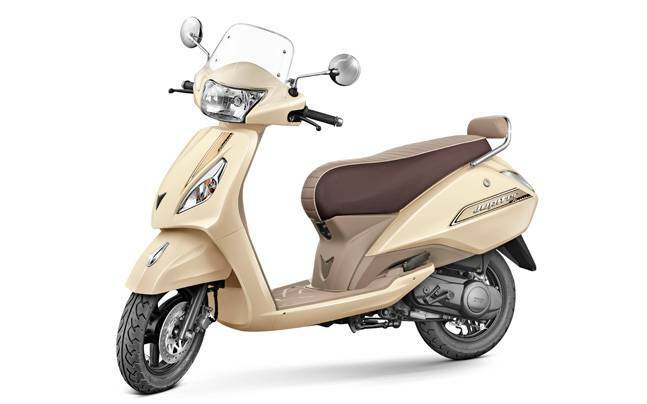 TVS Jupiter Classic edition is powered by a next generation, all-aluminium, low-friction 110cc engine that delivers an incredible mix of power, superior acceleration and best in class fuel efficiency. The metal bodied, TVS Jupiter Classic is styled to have a substantial on road presence, which delivers high-performance ride quality with superior ride comfort making it a perfect, sensible companion. The scooter also comes with TVS patented Econometer, which guides riders in both ‘Eco Mode’ and ‘Power Mode’ and the engine delivers best-in-class fuel economy in ‘Eco’ mode. TVS Jupiter Classic Edition is priced at Rs. 55,266 (Ex Showroom – Delhi) and will be available in all TVS dealerships across the country.